Alumina (aluminum oxide, Al2O3) has widespread use in the ceramics industry for refractory materials, abrasives, and porcelain. Many different sizes and chemically modified grades are available. Particle size affects the manufacturing and mechanical properties of these components, including packing density and mechanical strength of the final part. These materials are usually dispersed in water for measurement, with surfactant added to prevent agglomeration. DescriptionSolid oxide fuel cells (SOFC’s) offer the potential to greatly reduce man’s dependence on coal and oil for the production of electricity. They are clean, quiet and efficient. At the heart of these devices lies a complex combination of polycrystalline ceramic materials, each having to meet a particular set of structural and electrochemical requirements. Engineers control the performance of each component through manipulation of chemical and physical properties of the starting powders. 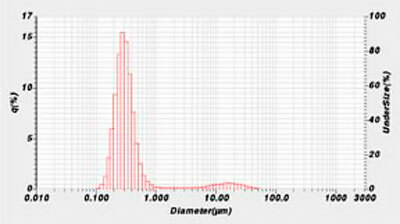 DescriptionParticle size analysis plays a crucial role in the manufacture of electronic materials for dielectric applications. These materials include single-phase powders such as barium titanate as well as formulations that contain many different oxide phases. In all cases, the particle size distribution has a great impact on their processing and performance. DescriptionThe particle size of piezoelectric ceramics plays a crucial role in calcination and sintering temperature, which affects the processing time, and, subsequently, the performance of the final pressed component. It is for this reason that particle size analysis is used at different stages of the manufacturing process; beginning with the raw materials through the final stage of the creation of a spray-dried powder. The LA-960 is ideally suited for tracking this synthesis. DescriptionAlumina has widespread use in the ceramics industry for refractory materials, abrasives, and porcelain. Many different sizes and chemically modified grades are available. Particle size affects the manufacturing and mechanical properties of these components, including packing density and mechanical strength of the final part. These materials are usually dispersed in water for measurement, with surfactant added to prevent agglomeration.